This study is about the contrastive analysis of suffixes in English and Uzbek languages. This study was done to find out the differences and similarities of suffixes in English and Uzbek languages and focused on form, function, and meaning. Technique for collecting data in this study is obtained from the documentation, including websites, journals, dictionaries and English and Uzbek morphology and grammar books. This research used the descriptive qualitative method. Contrastive analysis is used to describe the result of the study between English and Uzbek suffixes that had been compared. The result of research showed that there are five differences of suffixes in English and Uzbek in terms of their form, five differences in their function and six differences in their meaning. Also, there are three similarities of suffixes in English and Uzbek in terms of their form, six similarities in their function and three similarities in their meaning. Azimova, N. (2010). Uzbek an Elementary Textbook (O'zbek Tili Birinchi Bosoich). The United States of America, United States of America: Goergetown University Press. Brussmann, H. (2006). Dictionary of Language and Linguistics. (G. P. Trauth, Trans.) Newyork, U.S.: Taylor & Francis e-Library. Chamonikolasova, J. (2014). A Concise History of English. Brno, Czech Republic: Marsarykova Univerzita. Corballis, M. C. (2017). The Truth about Language. Chicago and London, USA: The University of Chicago Press. Dhammadassana, K. T. (2016). A Comparative Analysis on Word Formation Process in English and Sinhala. International Conferene on Lingustic in Sri Lanka (ICLSL), 2513-2954. Fang, F. (2017, January). 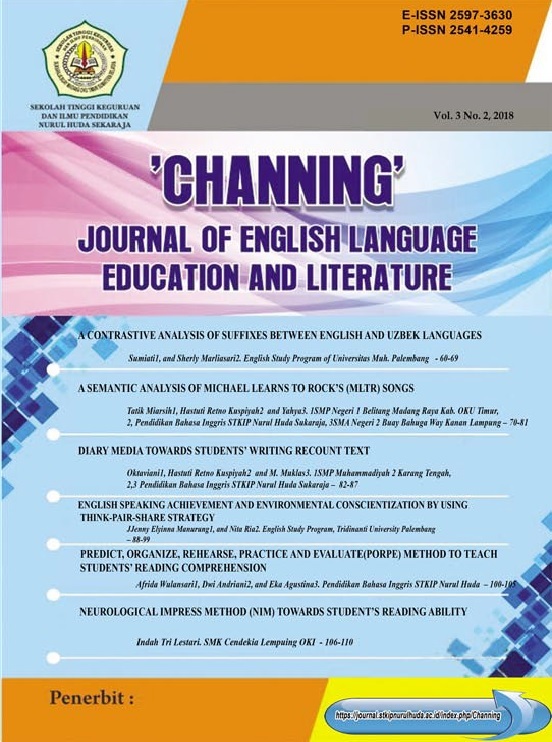 English as a Lingua Franca: Impliations for Pedagogy and Assessment. TEFLIN Journal, 28(1), 57-70. Finegan, E. (2012). Language: its Structure and Use (sixth ed.). U.S. (United States): Wadsworth Cengage Learning. Haspelmath, Martin & Sims, Andrea D. (2010). Understanding Morphology (Second ed.). London: Hodder Education. Iswara, D. (2016). Contrastive Analysis Between Indonesia and English Idioms Through The Word "Eye". Palembang: Muhammadiyah University of Palembang. Johanson, Lars & Csato, A. Eva. (1998). The Turkic Languages. London and New York: Rouledge. Llamas, C. and Watt, D. (2010). Language and Identities. Edinburgh, Scotland: Edinburgh University Press Ltd.
Okeke, C. O. and Obasi, G. T. (2014). Word Formation Process in Nigerian Short-message Service. Theory and Practice in Language Studies, 4(11), 2215-2222. Saeed, G. M. and Fatihi, A. R. (2011, May 5). A Contrastive Analysis of Inflectional Affixes in English and Arabic. Language in India, 11, 76-90. Satori, D. &. (2011). Metodologi Penelitian Kualitatif. Bandung, Indonesia: Alfabeta. Syahri, I., Sulaiman, M., & Susanti, R. (2017). Metodologi Penelitian Bahasa (Edisi Revisi ed.). Palembang: Penerbit Roemah Sufie. Trigan, H. G. (1992). Pengajaran Analisis Kontrastif Bahasa. Bandung, Indonesia: Penerbit Angkasa.